My English Book and Me 1 and 2 are black and white picture dictionaries. They can be used with ANY beginners, but we use them with our kindergarten students. 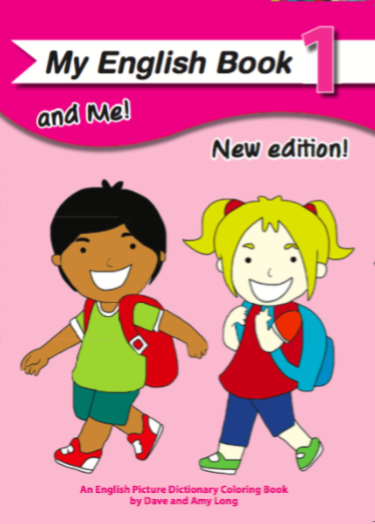 Ideally, students will come to our school as 4 year olds and begin My English Book and Me 1. After 1 year on My English Book and Me 1, most students progress to My English Book and Me 2. We assign 1 unit a week for homework. Children remember the words in the unit. They can also color, write the words, match and practice the question and answer as they remember the vocabulary. They can do as much or as little as they like. The important thing is they learn the words in the unit. When students come into our lessons, they do puzzles or lottos in groups of 3. The teacher checks the homework with each child. We begin with greetings: Hello, What’s your name? How old are you? And then we will check the homework: point and ask: What’s this? Most children (having studied for homework and knowing what to expect) answer correctly. But IF the child doesn’t know, then other children eagerly help—-telling the answer. This is good because it creates a friendly classroom where children help each other. The teacher will put a check next to the words the child knew with no prompting and a circle next to the unknown words. If there are many circles, we assign the same unit for homework the following week. If mainly checks, then we assign the following unit for homework. As you can see, each child works at their pace. Slower students might take 2 weeks to do 1 unit. Faster students, 1 unit a week. This works well for kindergarten students too because children progress at different levels, especially when young. After the initial checking and assigning of homework, we don’t use the texts in the class. BUT we will use the lottos, flashcards and bingos that accompany the text (in addition to phonics games and songs) to pre - teach or review the vocabulary and question and answers IN the text in a more dynamic and fun way. In the next kindergarten blog, I will go through WHAT we do in the lesson more thoroughly.